The first round’s over in the Australian Open and no giants have been toppled yet, but two are already exposing their vulnerabilities: No. 4 seed Stan Wawrinka and No. 5 seed Kei Nishikori were both stretched to five sets in their opening matches. More likely, Wawrinka just made a strategically sound shot—right at the body—at a crucial juncture of the match. “I’m sorry I touch him in the wrong place,” he apologized in the post-game presser. 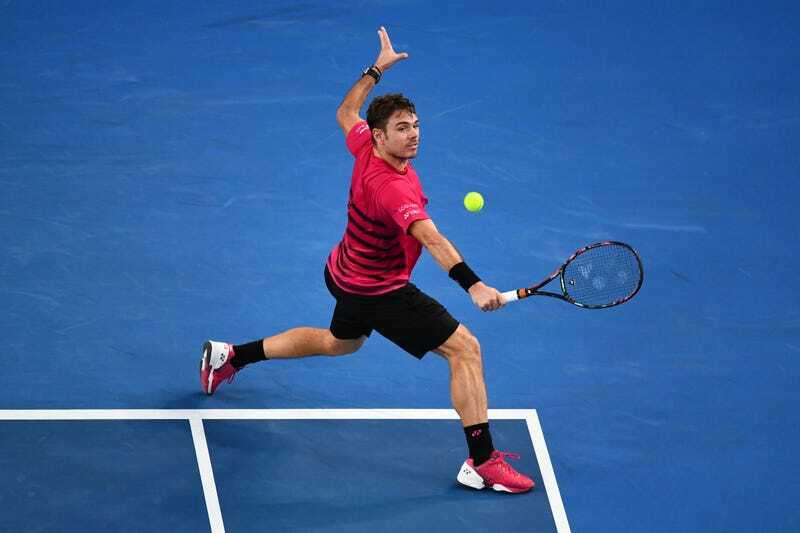 Given that Wawrinka rips some of the hardest groundstrokes in the game, it’d be a shock if that forehand was going any slower than 80 mph. Klizan’s future offspring will be grateful that his racket frame deflected the blow. Elsewhere, Kei Nishikori went up 5-2 in the fourth against Andrey Kuznetzov before letting the Russian claw his way back into the match, but he closed it out, 5-7, 6-1, 6-4, 6-7(6), 6-2. Over his career, the Japanese player boasts a 100-30 record in deciding sets, good for the all-time best winning percentage. Down the stretch there were occasional flashes of the precise, attacking baseline style that make him such a difficult opponent to outhit. At his best, that aggressive play can knock out anyone on tour, but as an undersized player with a history of minor injury, Nishikori’s perennial challenge is staying physically sound enough to compete. Facing this level of strain this early on in the two-week tournament doesn’t necessarily bode well, but we’ll have to see how he recovers against Jeremy Chardy in the next round.